There’s a good chance these companies — Nestlé, Pepsico, Coca-Cola, Unilver, Danone, General Mills, Kellogg’s, Mars, Associated British Foods, and Mondelez — own pretty much every brand in your cupboard. And they each employ thousands of employees to do so, making billions of dollars in revenue every year in the process, Business Insider reports. For customers to realise who controls the brands they’re buying, and in an effort to push these companies to make positive changes, Oxfam created a mind-boggling infographic that shows just how interconnected consumer brands really are. Mars is best known for its chocolate brands, like M&M and of course the Mars bar, but it also owns Uncle Ben’s rice, Starburst, and Orbit gum. Best known for its cereal like Froot Loops and Frosted Flakes — Kellogg’s also owns Eggo, Pringles, and Cheez-It. Also known for cereals, General Mills also owns brands like Yoplait, Hamburger Helper, Haagen Dazs, and Betty Crocker. Coca-Cola has been moving beyond soda for a while, and they now own brands including Dasani, Fuze, Honest Tea, and Nos. Chances are, if you pick up a product in a shop, Unilever’s logo is usually on it. Their diverse list of brands includes Axe body spray, Lipton tea, Magnum ice cream, and Hellmann’s mayonnaise. This British company owns Primark, and brands like Dorset Cereals and Twinings tea. Pepsi doesn’t just own the fizzy soda by the same name, they also owns brands like Quaker Oatmeal, Cheetos, and Tropicana. Chances are the first thing that comes to mind when someone says ‘Danone’ is yogurt. But the company also sells medical nutrition products and bottled water. Centralising their brands on snacks, Mondelez owns Oreo, Trident gum, and Sour Patch Kids. Nestlé owns Gerber baby food, Perrier, DiGiorno, and Hot Pockets — plus, of course, candy brands like KitKat, Smarties, Aero and Rolo. So there you have it. 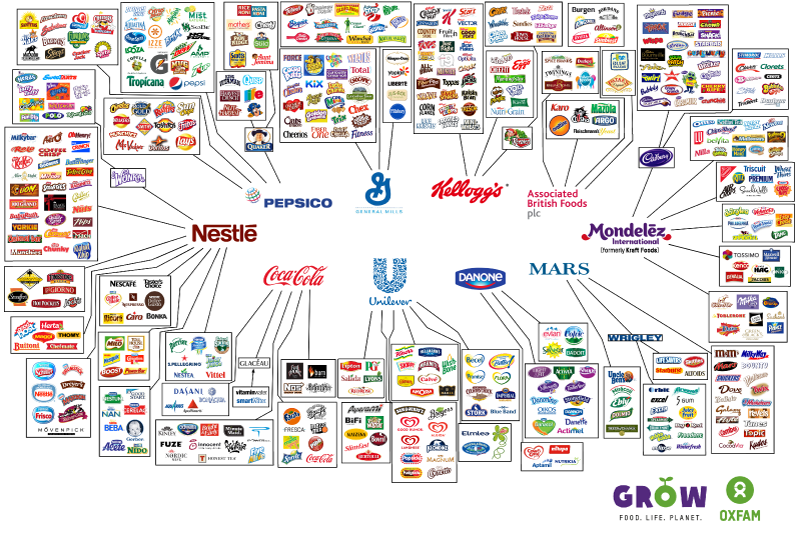 Nearly every brand in your cupboard owned by just 10 companies. The more you know.